The eSquared Asphalt Maintenance team is highly experienced in the accurate placement of road, parking lot, and construction pavement markings, and can complete your marking job quickly and flawlessly. Whether you need arrows or lanes on your parking lot or you are preparing for a road construction project, our team has you covered. We are experienced in both hot and cold application markers, as well as reflective and decorative paint markings. When you need skilled, knowledgeable pavement marking in Waco and Temple, TX, call our experts at 254-716-8685 for your evaluation. Each type of pavement marking material has ideal purposes in mind when it’s created. Therefore, there is, in fact, a perfect marking material for each project. Our experts will evaluate your project and discuss all of your options with you, explaining benefits, lifespans, and application methods to help you make the best decision for your project. Call us for pavement marking in Waco and Temple, TX! This low-cost system is used when the work to be done will be covering the current layer of concrete. Pavement marking paint is available in both water and chemical-based formulas, as well as reflective formulas and, is one of the quickest installed options. Pavement paint can be used for both permanent and temporary marking jobs. Tape marking solutions are available in both temporary and permanent types and are generally used in high-traffic areas. These tapes are extremely durable and still highly reflective in the rain and bad weather conditions. The tape is applied over an adhesive that provides the ultimate bond for outstanding placement. These small yellow and white markers are typically used in partnership with paint or tape and enhance the effectiveness of the system. These markers are applied by fastening one side to the concrete while the other end sticks up, creating the ultimate visual traffic aid. This specialty tape provides the convenience of pavement tape with the effectiveness of pavement markers. This tape style can be applied to both asphalt and concrete and creates a rumbling sound when driven over as a warning. Each type of pavement marking material has its own list of benefits that our experts can help explore. Our professionals will discuss your project with you to discover and apply the perfect concrete marking system for your needs. 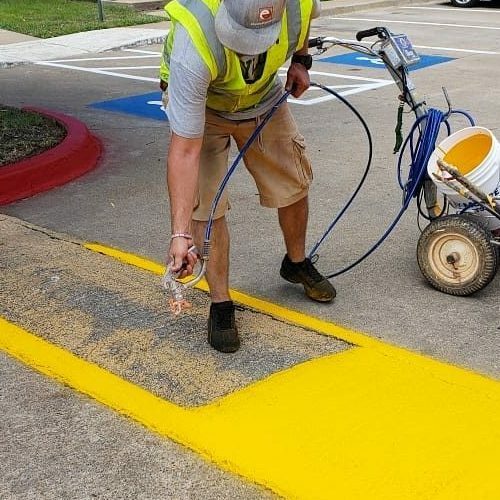 Whether you need parking lot marking or road makers applied, our painting experts can complete your project quickly and efficiently. When you need reliable pavement marking in Waco and Temple, TX, call our painting pros at 254-716-8685 to schedule your consultation.